The Rest Is Silence by James R. Benn: Synopsis and Online Purchase Options. 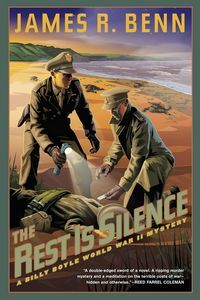 Synopsis (from the publisher): When an unidentified corpse washes ashore at Slapton Sands on England's southern coast, US Army Captain Billy Boyle and his partner, Lieutenant Piotr "Kaz" Kazimierz, are assigned to investigate. The Devonshire beach is the home to Operation Tiger, the top-secret rehearsal for the approaching D-Day invasion of Normandy, and the area is restricted; no one seems to know where the corpse could have come from. Luckily, Billy and Kaz have a comfortable place to lay their heads at the end of the day: Kaz's old school chum David lives close by and has agreed to host the two men during their investigation. Glad for a distraction from his duties, Billy settles into life at David's family's fancy manor, Ashcroft, and makes it his mission to get to know its intriguing cast of characters.